When M. and I heard last weekend's weather was going to be so nice, we decided to road trip it on Saturday. I perused Google Maps for a bit, as well as Hilary Nagle's blog Maine Travel Maven. Hilary writes for the Moon travel guides and has a great website to help those from here and away discover new eats, stays, and activities in the great state of Maine. We decided to head down to Cape Porpoise, M's old stomping grounds from Living in Maine, Round 1. So we packed a cooler with some wine, and drove down scenic Route 1 out to Cape Porpoise for lunch. See the tiny lighthouse and a clammer? After we drove through M's old neighborhood at Goose Rocks Beach (which would make for a totally romantic winter rental), we drove out to Cape Porpoise. There's not too much out at the point- just some restaurants, a lighthouse very far away, and a working dock with lots of workboats moored off of it. Thanks to Hilary's advice (her favorite lobster shacks), we knew to have lunch at Cape Pier Chowder House. The Chowder House is right next to two other restaurants I want to try- Pier 77 and the Ramp. Pier 77 is the fine-dining version upstairs, while the Ramp is the bar/lounge downstairs with a delicious looking menu and playful decor (lobster buoys and old camp paraphernalia). The Chowder House has indoor and outdoor seating, the latter being a big deck overlooking the mooring field. And, we were happy to see that they have a selection of wine and beer. After ordering, we took our ordered Shipyard Summers and sat on the deck to await our selection of fried food. We almost ordered fries, but M. is a sucker for onion rings and when I saw that they were homemade, I hoped they be good. And were they ever. Look at that giant pile of fried! M. remarked over how they weren't greasy in the least. We both thoroughly enjoyed our food- everything was hot, cooked just right, with soft buns and tartar sauce piled high. We did spend $33 for lunch, so not the cheapest option, but that's to be expected when eating seafood in Kennebunkport. Afterwards, we drove into the Kennebunkport to walk around Dock Square, try some (terrible) wines at a wine tasting, and do some more tourist watching. Have you had any fun road trips I should recreate on one of our upcoming lovely fall weekends? These summery, melty tomatoes were pictured on the cover of a recent Saveur magazine that my bf was nice enough to pick me up while traveling. Because it was on the cover, this beautiful picture been staring at me from the magazine rack and hanging out in the back of my mind. Now that we're finally! rolling in tomatoes (yes! ), I decided to make this recipe with a pint of cherry tomatoes, instead of the big ones in the recipe. Still delicious. And best of all, super easy. Simply spread the tomatoes, garlic, and oregano (or thyme) out on a baking sheet and drizzle with olive oil. Roast in a hot oven (425 degrees F) for 20 to 25 minutes until tomato skins begin to split. Saveur suggests serving the tomatoes with crusy bread or as a side dish to fish or chicken. I spread the roasted garlic on cheesy bread and topped it with the tomatoes, and it served as an awesome, light dinner. Ah, a weekend with no obligations. No waking up early, my mind already racing with things to do that day. Just the Sunday paper, my kitchen, my boyfriend, and 48 hours of nothing. I did take the weekend to complete two food preservation projects I'd been wanting to do this season, but I don't consider that an obligation. I started my fermented pickles on Saturday, and on Sunday, I made corn relish. Yeehaw. While I can't say they'll turn out alright, I can say that fermenting pickles is ridiculously easy. I started with 8 lbs. 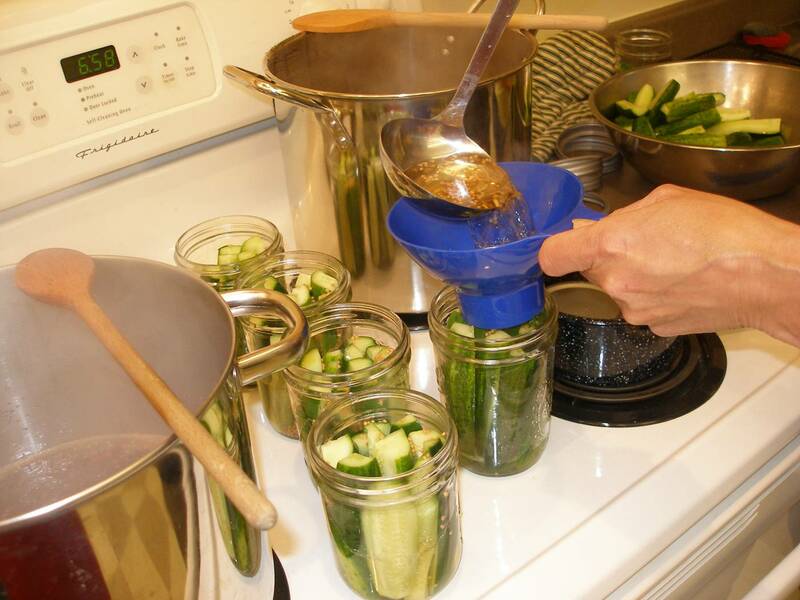 of pickling cucumbers, a 5-gallon food-grade bucket, some spices, and some vinegar. After layering the spices and cucumbers in alternate layers, I added the brine and weighed down the cucumbers with a glass bowl and a brick from the sidewalk (I'll put it back, I promise!). After my cukes were already to go, I just covered them with a kitchen towel and placed them under my dining room table. With the cool weather we're having, it's about 70 degrees in my apartment- the perfect temperature for fermenting. Now I get to check them obsessively until they're done fermenting! They'll start to bubble soon, and then a few weeks later will stop. That's when the fermenting process is complete. I know those who value fermentation for its health benefits will disapprove, but I'm going to heat process my pickles when they are fully fermented. Then I'll be able to put up my pickles until winter, rather than try to store a 5-gallon bucket in my fridge. I'll update you on the fermenting process when something changes! And can I just say, making corn relish is a lot of work! I mean, I knew that, but yeah, still a lot of work. But it's well worth it, and the recipe for it (as well as fermented dill pickles) is below. Boil ears of corn 5 minutes. Dip in cold water. Cut whole kernels from cob or use six 10-ounce frozen packages of corn. Combine peppers, celery, onions, sugar, vinegar, salt, and celery seed in a saucepan. Bring to boil and simmer 5 minutes, stirring occasionally. Mix mustard and turmeric in 1/2 cup of the simmered mixture. Add this mixture and corn to the hot mixture. Simmer another 5 minutes. If desired, thicken mixture with flour paste (1/4 cup flour blended in 1/4 cup water) and stir frequently. Fill jars with hot mixture, leaving 1/2-inch headspace. Use the following quantities for each gallon capcity of your container. Wash cucumbers. Cut 1/16-inch slice off blossom end and discard. Leave 1/4-inch of stem attached. Place half of dill and spices on bottom of a clean, suitable container. Add cucumbers, remaining dill, and spices. Dissolve salt in vinegar and water and pour over cucumbers. Add suitable cover and weight. Store where temperature is between 70ºF and 75ºF for about 3 to 4 weeks while fermenting. For more information on fermenting, please visit the National Center for Home Food Preservation's page on fermenting. 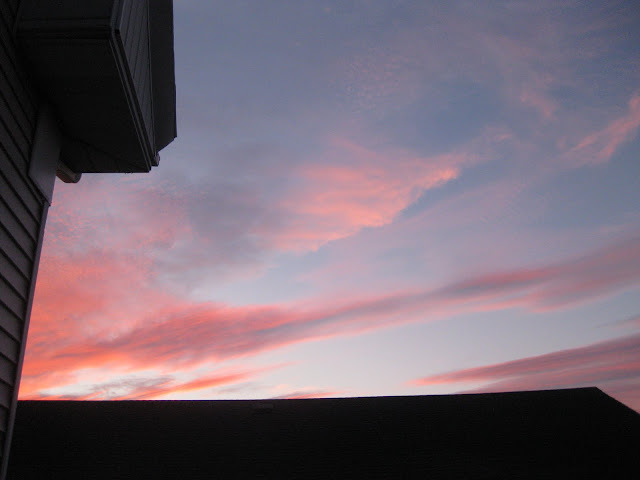 Last night was the perfect Maine summer evening; we had friends, sat on the deck, drank wine, and watched the sunset. After the sun dropped, it was a little chilly and buggy, so we went inside for a big home cooked meal. Nights like these will make it OK when the daytime temperatures begin to cool, I no longer consider shorts and bikinis as appropriate weather wear, and sleeping under a thick comforter is the norm. As we enjoyed the weather and company, we chowed on these little baked corn and lobster fritters, made by M. from a recipe in Hannaford's Fresh magazine. The fritters are baked, not fried, making them feasible for a weeknight dinner, and surely better for you. Served with a lemon aioli, you won't miss the fried taste at all. In a food processor, pulse garlic until finely minced. Add mayonnaise, mustard, lemon zest, lemon juice, and pepper. Pulse to combine until smooth. Transfer to a sealed container and refrigerate until ready to use. Preheat oven to 375 degrees F. Spray 2 baking sheets with cooking spray and set aside. Spray a nonstick skillet with cooking spray and heat over medium-high heat. When pan is hot, add onions and saute until softened and starting to brown, about 4 minutes. Set aside to cool. In a medium bowl, mix flour, baking powder, salt, and pepper. Set aside. In a large bowl, combine eggs, milk, and oil and whisk together lightly. Add reserved onions, corn, and lobster. Add dry ingredients and stir until just combined; be careful not to overmix. Drop heaping tablespoons of the dough onto the prepared baking sheet, 2 inches apart; there should be 22 to 24 fritters. Bake for 12 to 14 minutes or until a toothpick inserted into the center of a fritter comes out clean. Preheat the broiler during the last 5 minutes of baking time. 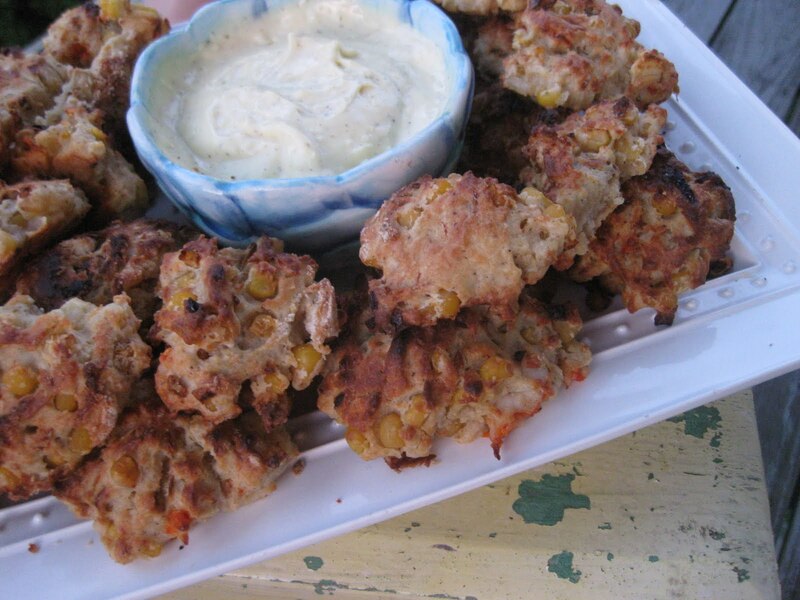 Place fritters under broiler for about one minute, until lightly browned. Serve warm with aioli dipping sauce. Top with lemon wedges if desired. As a follow up to my How to Can Dilly Beans post, I'd like to share with you how to pressure can vegetables - in this case, beets. Beets need to be canned in a pressure canner because they are a low-acid food. Low-acid foods (vegetables, meat, seafood, and dairy) can contain botulism, a deadly neurotoxin. In a pressure canner, high temperatures are achieved (250 degrees F and up), which kills any botulism spores that may be present. So please; don't mess around, and can your vegetables in a pressure canner. If you don't want to invest in a pressure canner, freezing is always a safe alternative to canning. Here's my pressure canner: a 16-qt. Presto weighted gauge. The lid locks into place once all the jars are loaded inside, and the weight sits on top of the pressure vent in the middle of the lid. Newer models have emergency safety vents so they don't explode if they become over-pressurized. Here's the weight, which can be changed to achieve 5, 10 or 15 pounds of pressure. A dial gauge is a gauge that reads the pressure inside the canner and displays it on a dial face, much like a tire pressure gauge. These gauges should be tested for accuracy yearly, so if you are buying a new pressure canner, I recommend a weighted gauge, since it will always be accurate. Right away I noticed how pressure canning was different- you start by preparing your recipe. There's no big pot of water to boil and no sterilizing of jars needed. Just start washing and chopping vegetables. First, the beets had to be boiled for 30 minutes to be able to peel the skins off. My recipe said the skins should peel off easily, but I found some skins slipped off easy and others flaked into pieces and were hard to remove. Once I had all the beets peeled, I sliced the bigger beets into 1/2" slices and packed them all into jars, leaving 1" headspace. I topped off the beets with some water that had been heated to a boil and applied the two-part lid and screwband. After preparing the beets, I followed the manufacturer's instructions for operating the pressure canner. To operate the Presto canner, place the jars in the canner and add enough water to reach the first fill line. Lock the lid into place and turn the heat to high. The water will turn to steam and the canner will start to pressurize. When the canner reaches a certain pressure, a lock will pop into place, preventing the canner from opening until it is fully unpressurized. The canner will begin to vent steam out of the vent in the top of the canner lid. When the steam is in a steady steam, start timing for 10 minutes. Once 10 minutes has passed, add the weight to the steam vent. The canner will come to pressure and cause the weight to rock back and forth. When the weight is rocking steadily, start your processing time, in this case 30 minutes at 10 lbs. of pressure. After processing time is up, turn the heat off and wait for the canner to cool. The lid will open when the canner has lost all pressure, which was about another 30 minutes in my case. In total, pressure canning beets took three hours! I used 4 lbs. of beets and got 5 pint jars worth. While pressure canning was a fun experience the first time, I don't see it becoming a part of my canning repetoire. It just took too darn long, and anyways, I can freeze most vegetables that need to be canned. And beets are available year round in Maine, anyway. But I hope that if you are interested in pressure canning, that you give it a try, since it can't be nearly as scary or hard as you might think it is. The 2nd annual Backyard Locavore Tour is upon us again! The University of Maine Cooperative Extension staff, Master Gardener volunteers, and Master Food Preserver volunteers are bringing you twelve garden sites full of food preservation and gardening information, plus food samples. From Freeport to Cape Elizabeth and all the way out to Standish, the 12 garden sites will cover composting, beekeeping, raising chickens, organic gardening, pest management, square food gardening, canning, freezing, drying, and root cellaring. There will be pickles, salsa, jam, herbal vinegars, relish, apple pie filling, and more to taste. I will be at the East End Community Garden talking about pickling (with dilly beans to sample), so pick up your ticket today- only $15 for adults, $12 for seniors, and kids under 12 free- and start planning your route on this year's Backyard Locavore Tour. The weather is going to be beautiful tomorrow and you won't want to miss this year's DIY gardening and food preservation bonanza. To purchase tickets, call 207-780-4205 or visit the Cooperative Extension office at 15 Chamberlain Avenue in Portland on the USM Campus. Thanks to Avery Yale Kamila for a nice write-up in her Natural Foodie column and to Ray Routhier for spotlighting the Cooperative Extension's food preservation programming in last Sunday's Press Herald. Ed Note: I tried a different type of wings at Binga's and fell in love. Check out my latest review to see what changed my mind. When I first moved to Portland, I heard many people say the best wings in town could be found at Binga's Wingas. But before I could confirm this opinion, Binga's on Congress St. had a fire and shut down permanently. Now I know they have another location in Yarmouth, but I'm inherently lazy. Plus, with all the good wings to try in town, I didn't see the need to schlep to Yarmouth. Binga's finally partnered with The Stadium to bring their wings back to Portland. So way back when, during the World Cup, I met Roomie A. and C. there to eat lunch, drink beer, and watch the men, I mean game. The Stadium has a great selection of beers, and I knew from previous happy hours here that they always have great beer specials too. So I usually just ask what's on special and order that. It's like $2 Heinekens or something, but it's cheap and I love throwing caution to the wind and ordering whatever's on special. There's a lot of TVs, and I mean a LOT. So if you're looking for a place to drink and watch a sports game, this is a front runner. There are even booths that have a TV in them. It's like a living room and bar in one! Dream come true. Between my wings (6 for $6.49, ordered with Hot Buffalo sauce), and both of my roomies' sad, sad falafel wraps, we were not impressed. My wings were all right, but they were breaded, which I feel is unnecessary. The hot sauce was nice and hot, flavorful too- very Franks Red Hot-y- but when I asked for ranch with my wings, the bartender said, 'We only have blanch,' like everyone knows what blanch is. I had to ask, and she explained it's blue cheese and ranch mixed together. *record screech* Wha??? So, TV and beer? Yes. Food? Wings? Hell no. Pass! I bet they can fry french fries all right (not the sweet potato fries- those are breaded and gross), so maybe a plate of fries is as far as I'd go. But after a few beers and the drunk munchies kick in, we'll see how long my no food at the Stadium rule lasts. I just may be the last person in town to make it to Bayside Bowl, and I'm glad I finally did. Of course, there's the bowling, which is awesome (I decided I should go more, so I don't throw every other ball in the gutter), but I was happy to learn that the food is good too. M. and I went down to the bowling alley early last Friday night, before all our friends showed up to celebrate A.P. 's birthday. We snagged a seat at the bar, under a big skylight that let in lots of natural light. The bar has a fairly standard selection of local beers on tap, most of which are $4, except for Moosehead at $2.50. The menu, however, is anything but standard. Definitely an eclectic mix of food, from chicken chimichangas to coconut curry chicken poppers. It's a fairly large menu, and I hope they have the talent in the kitchen to pull off such a wide variety of food. Our double cheeseburger ($9) gave us every indication that they could though. The burgers are pretty thin, so even though our bartender asked us for a temperature on the burgers, they were pretty well done. But they were greasy enough and on a huge soft roll, so we didn't mind. The pile of homemade fries that came with the burger wasn't excessive, but plenty of food to split between the two of us without weighing us down for our bowling game later. Our service at the bar was pretty bad- I'm not into the 'abrupt, rude bartender, just 'cuz we're at a bowling alley' act, but once we moved to a table in the bar, our server was very nice and accommodating- even happy to get us what we needed to cut and serve the birthday cake we brought in. There was live music as well, which was really loud if you were in the bar area, but fine to listen to from the bowling lanes. But I really enjoyed the space, the food, and the atmosphere, so I'm looking forward to going back frequently for cheap eats and fun with friends.